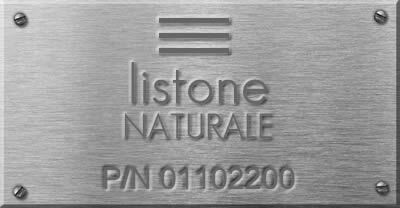 Pure natural elements grown on the Italian hills, an entirely handmade production, the complete lack of chemicals, the perfect stability of each piece: these are the facts, Listone Naturale is the name. A layer of Umbrian or Tuscan oak above two layers of Tuscan chestnut, using the technology of the nature to create a stable hardwood floor, perfect to be installed floating above underfloor heating systems. Nothing comes from factories. Each part of Listone Naturale is completely natural and traceable. Umbrian Oak (Quercus Cerris), Tuscan Oak (Quercus Ilex), Tuscan Chestnut (Castanea Sativa) populate our hills and they are subject to strict health and cutting checks. The difference between each hill in tems of altitude, solar exposure and soil content gives a specific identity to each tree. Only a small, flexible and handmade production is able to handle these materials. Verify the authenticity of the product is simple, just enter the product serial number to receive information about the production, provenance and marketing.